My photographic projects examine visual representations of social groups and explore technological and material aspects of photographic media. I investigate photographic modes of display and possibilities of photographic representation. Expanding the photographic image beyond its frame, traditional format, and the narrative is central to my artistic strategies. In my projects, I challenge the role of the photographer in production of images, and contest the idea of the photographic moment. Recently, I built on these themes to examine photographic representation of special political and cultural histories. These representations include photographic archives and related artifacts, which I treat as material to produce new images and installations. I interrogate the impermanence of photographic archives and their preservation in advance of digital technologies. I work with projected images. Turning a two-dimensional surface into a three-dimensional space offers a way to expand the perception and experience of images in space. I transform photographic images into objects, by way of their display, mounting, and placement in space. I try to activate the role of photographic equipment in the display of my work. 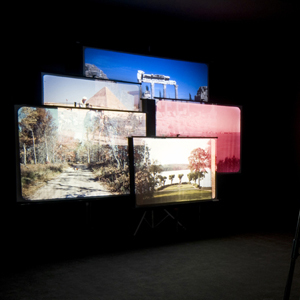 These relations open a conversation between photography and installation. I work with analog photographic technology, treating it in a contemporary digital mode. Either presented as a photographic print, or as a projected image within installation, the pieces confront photographic representation, and attempt to reveal the layers constituting the image. I aspire to contest the medium of photography, applying strategies that challenge the conventional notions of production and display of photographic images.